Remember the Wikipad? Back in October, this gaming tablet hybrid device was delayed by its makers, stating that there was still a few enhancements they needed to complete on the device before launch. Well, it’s February now and we are finally hearing the first news about a second attempt at launch. Although, this Wikipad has changed quite a bit. Previously, the Wikipad had a 10″ tablet as its main focus, but after some research, the company found that a 7″ tablet was easier to handle and operate. Not only is it more compact, but by using a 7″ slate, the Wikipad can meet a new low price of just $250. Much more reasonable and accessible to the youth than the previous $500. Essentially, think of this new tablet inside the controller shell as a Nexus 7 in terms of specs. It has a Tegra 3, 7″ 1280 x 800 display, runs Android 4.1, 1GB of DDR3 RAM, 16GB of storage (upgradeable to 32GB), and has a 4,100mAh battery. With this new low price and look, are you just a wee bit interested? LOS ANGELES, CA – February 7, 2013 — Wikipad Inc. today announced that its 7” Wikipad tablet will be available from leading retailers in spring 2013 at a launch price of $249. Wikipad combines the unrivaled gaming experience of a console with the functionality and portability of a premium tablet, thanks to its unique attachable game controller. The 7” Wikipad possesses the same powerful product specs as the previously shown and forthcoming 10” version in a form factor that is even more portable and at a price point that is even more accessible to gamers everywhere. In addition to the new compact form factor, refinements have been made to the dual-analog stick controller to ensure lightning-fast response times and the best gaming experience possible. Wikipad also announced the relaunch of its website that now includes a comprehensive support page that has dynamic links to social networks and technical forums. 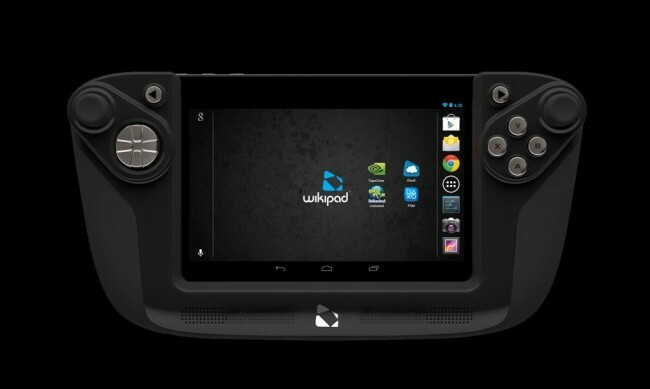 The Wikipad is the only tablet to possess the unique combination of truly immersive video game experiences found in consoles with the functionality and portability of a tablet thanks to its award winning attachable dual-analog controller. It offers a premium 7″ IPS screen, 16 GB memory with micro SD slot to support an additional 32 GB of storage, ultra-light and thin chassis, is powered by the NVIDIA® Tegra® 3 quad-core mobile processor and it is optimized for cloud gaming. With an aspect ratio of 16:10, the Wikipad tablet offers true widescreen HD display. Consumers will have access to entertainment and videogame content from partners and services including PlayStation®Mobile, Big Fish Games®, TegraZone – NVIDIA’s free app that showcases the best games optimized for the Tegra processor – Google Play™, OnLive and many others. When the gamepad controller is detached, Wikipad’s sleek design and full Android 4.1 Jelly Bean functionality make it a powerfully versatile device whether you are surfing the web, reading emails or enjoying films, music and apps at home or on the go.